The original log-built Dutch Joe Schoolhouse sat alongside the Dutch Joe Creek off of Brown’s Hill between the Gilroy and Shaffer homesteads. It served first grade through eighth grade. After the burning of the first Dutch Joe Schoolhouse in 1932, local families constructed the white stick-built building that sits on the museum grounds today. The school operated until 1942 when, along with its students, it moved to the Savery School. Until 1972, all 1st and 2nd grade Savery students attended classes in the little white building. Savery School District #15 donated the schoolhouse, which now represents all the one-room schoolhouses of the area, including authentic pieces from the schools like the segments of slate blackboard from the old Baggs School. Written and researched by Debbie Gilroy, 2009. The Dutch Joe School, now located at Little Snake River Museum, was located next to Dutch Joe Creek. The log school that was built in the early 1900’s burned down in 1932. A new white stick built, one room school house was built for the students who were attending the old log school house about 1 mile south of the Shorty Gilroy homestead on Dutch Joe, close to the Shaffer homestead. Students who attended the Dutch Joe School from 1928-1942 included: Faye, Lloyd and Eugene Gilroy, Don, Miles, Dolly, Violet, Doris, Pola and Teddy Barney. Miss Janet Barney, a sister to George Barney taught school at the Dutch Joe School in 1928. Mr. Omar Wallraven was the teacher in 1929. Eugene Gilroy can remember Mrs. Evelyn Pearson being his teacher who lived in the back of the old log school house. He can also remember Mr. Wesley Morrow and Wesley Morrow’s brother being his teacher while attending school at Dutch Joe. Emma Blair moved to the Nicholson ranch and then joined the Barney and Gilroy kids in the shinny new white school house located on Dutch Joe in 1933. Edward Nicholson did not attended school at Dutch Joe School because the little country school closed and students attending Dutch Joes School would attend school in Savery. The building was moved down to Savery, next to the two story school house in 1940’s. 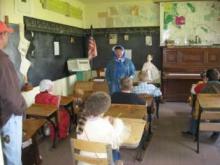 1st and 2nd grade students attended class in the little white school house. The Dutch Joe School was only one of many one room school houses in our valley. The little white one room Dutch Joe Schoolhouse has found its final resting place located to the south of the museum property in Savery, Wyoming. It holds memories and memorabilia from many of the one room school houses in our valley.